When Depave founder Arif Khan tore down his garage in 2005 and replaced it with a grove of fruit trees, he realized the same action could be applied on a much larger scale. 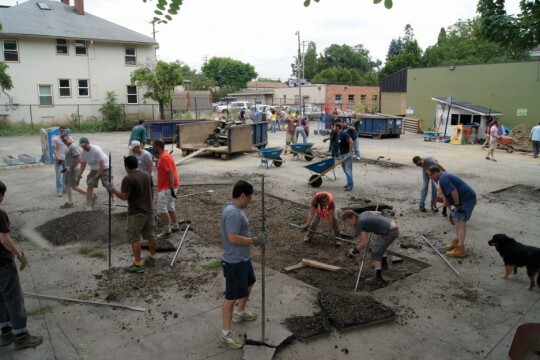 Three years later, Depave’s first parking lot transformation was complete: Khan and 147 volunteers transformed an under-utilized asphalt lot into the Fargo Forest Gardens, a community garden. The nonprofit will mobilize workers to remove impervious paving for anyone who asks; past depavings have included school playgrounds, businesses’ parking lots, and residents’ driveways, amounting to 100,000 square feet of asphalt that is no longer contributing to the negative effects of polluted stormwater runoff. Depave also helps in the process of replacing these spaces with native-plant gardens.